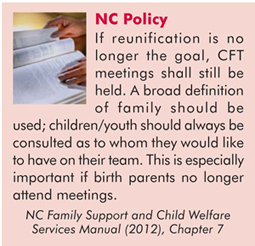 As you know, county DSS agencies in North Carolina hold child and family team meetings (CFTs) with families involved with child welfare services. The primary functions of these meetings are to engage the family and other interested parties in joint decision-making and to provide the family with support. CFTs address the family’s strengths and needs and how these affect the child’s safety, permanence, and well-being. Each meeting also results in a plan that specifies what must occur to help the family safely parent the children. Child and family team meetings occur soon after child protective services decides to substantiate or reach a finding of “in need of services.” CFTs are used with the family throughout the life of the family’s case, even if it is unnecessary to remove the child from the home. Family-centered meetings of this type offer a host of potential benefits to families, children, and the professionals who serve them. But what about meetings with older youth in foster care who, for whatever reason, don’t have parents or birth family members who can attend CFTs with them? How should agencies approach CFTs when the “family” in question is a single teenager, a “family of one”? Even if their birth family is not in the picture, most teens in care have some kind of support system they can call on during a CFT, so the “family of one” situation doesn’t come up all that often. Yet it does occur. Child welfare agencies need to have a formalized approach that ensures these youths’ voices are reflected in their plans and that supports are set in place with their involvement. Unfortunately, there are still agencies in North Carolina that hold case planning meetings that are agency-focused, implemented without the involvement of youth, and do not insist on the involvement of the youth and his or her supporters. Youth who are a “family of one” should have CFTs that involve an objective facilitator, the youth’s chosen support persons, community providers, and agency personnel. Tell the young person to invite whomever they wish. Don’t screen out anyone. They will be the persons to whom the youth goes for support, regardless of our opinion. They should be at the table. If the youth refuses to attend, or says he or she can’t miss school, etc., postpone the meeting until the youth can come. This will send the message that the meeting is useless without their involvement and input. Can you imagine a more powerful (or empowering) message to send to a youth in foster care? The figure above illustrates the general structure of Child and Family Team meetings in child welfare in North Carolina. Many practitioners have successfully adapted this process to hold CFTs with “solo” teens. An agenda is formulated at the beginning of the meeting with the youth, capturing issues they wish to address. Each participant in the room signs the confidentiality form and we then proceed. The youth takes the lead. Everyone has a chance to be heard. Feedback and outcomes are written under each heading for the note takers. Copies of the notes are given to the youth for reference. Meetings are held around the youth’s schedule to ensure that she is present. Brown believes this approach helps meetings with “solo” teens go smoothly, leading to greater buy-in from the youth and other parties and, ultimately, more positive outcomes. To learn more about involving teens in CFTs, attend the ABC’s of Including Children in Child and Family Teams, which is described below. This one-day skill-building course teaches North Carolina child welfare professionals how to prepare children for family meetings, make sure children’s voices are heard, and ensure their safe participation. To learn more or for class times and registration information, log in to www.ncswlearn.org.